OnSign TV has partnered with Flexitive, a cloud based HTML5 editor. This allows you to create animations and interactive content without programming expertise. You can share the assets on your signage display from an app with an app. Display beautiful smooth animations on your signage. Note that you need to subscribe to Flexitive in order to use their platform. An OnSign TV subscription alone does not include their services. Learn more about Flexitive and create a free account here. In your Flexitive account, look for the creative you wish to display with your signage. Click over the creative ID. It is located on the top-right corner of the item. As you click, it will be copied to your clipboard. In your OnSign TV account, click on the Content tab. Click on “New" and then "App”. Pick the “Third Party” category, look for the “Flexitive App” and select it. 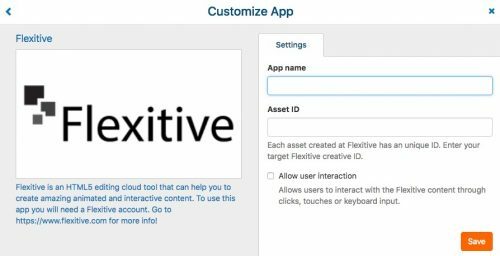 Paste de Flexivite creative ID into the “Asset ID” field. Allowing user interaction is optional. Save it, and the App is set to be added on your campaigns!